Do you know someone whose life has been affected by breast cancer? Have you felt helpless in the face of this insidious foe? Do you wish you had a way to fight back? Can you endure a few blisters? Can you shake off a couple of muscle cramps? Can you deal with sun, heat, rain, wind, humidity, mud, bugs, and, once in a while, even hail and snow? Can you carry an overstuffed backpack filled with medical and comfort supplies for 40 or 60 miles over two or three days? Can you be empathetic, charming, funny, and incredibly good looking while walking 20 miles or more a day? Can you do all of the above while maintaining an exceptional level of good cheer? If you answered “yes” to all of these questions, you may be a Man With Heart! Can you raise a couple of thousand for the cause? Okay, in all seriousness, the challenge is not as daunting as it sounds. The walks are filled with rest stops, refueling stations, and porta-potties, and we have different groups of guys walking at various paces, so you can always find a pace to suit your style. The fund-raising can be conducted online through your personal MWH donor page, including a credit card payment option. And if you come up a bit short, our team bands together to help you make up the difference. Sign up for the Boston Avon 2-day, 40-mile walk here. Select the “register” button; then select “click here to join an existing team; then specify “Men With Heart.” The next Avon Boston walk takes place on July 9-10, 2016. 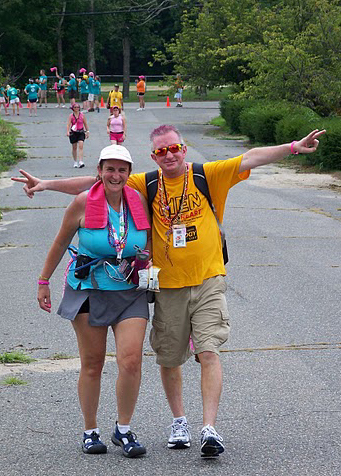 Sign up for the Philadelphia Komen 3-day, 60-mile walk here. Select “Join a Team” and then specify “Men With Heart.” The next Komen Philly walk is scheduled for October 14-16, 2016. Want more info before you commit? Send an email to scott@menwithheart.org or paul@menwithheart.org or jack@menwithheart.org with any questions or concerns. We look forward to welcoming you to the MWH team!